A modern take on an old classic, CBS' re-imagining of Hawaii Five-0 is more than just a remake. Instead of simply banking on the brand and churning out yet another prime time police procedural, they took the heart of a beloved '70s show and gave it a sleek, pulse-pounding makeover set in one of the most gorgeous locations in the world. Like the original, Hawaii Five-0 ("H50" to fans) follows a small, specialized task force dedicated to protecting the picturesque beaches of Hawaii. However, it breaks from its predecessor when it comes time to battle the bad guys. H50 has to deal with modern crime and everything it represents, including bombs, terrorist plots, government interference and even the occasional tsunami. It's the tropics, after all! H50 also faces another threat - one from within. As a team made up of strong, hot-headed personalities, they fight each other as often as they fight their enemies. Team leader Steve McGarrett (Alex O'Loughlin) is passionate but reckless, often utilizing his background as a Navy SEAL to justify his off-the-books police work. He's the type who prefers grenades to Miranda rights, much to the frustration of his partner, buttoned-up detective Danny Williams (Scott Caan). Cousins Chin Ho Kelly (Daniel Dae Kim) and Kono Kalakaua (Grace Park) round out the team, playing a wrongly-accused police veteran and an eager rookie, respectively. If these names sound familiar, it's because you've seen them all before. Scott Caan was a regular in the Ocean's Elven series before he ever stepped foot in Hawaii, and Alex O'Loughlin has been in everything from the vampiric Moonlight to the short-lived hospital drama Three Rivers. Grace Park, of course, is well-known to sci-fi fans for her role in Battlestar Galactica, and anyone who ever shook their fists at Lost will recognize the ruggedly handsome features of Daniel Dae Kim. (Lost fans will also appreciate the casting of Terry O'Quinn in season two! )Hawaii Five-0 premiered in 2010 to modest success, and the numbers held up long enough to bring it back for a second season. A third has been commissioned and will premiere in fall 2012. Now, just try to keep the theme song out of your head. While Adam investigates the murder of an undercover FBI agent about to wed the daughter of a Yakuza leader, Noelani is held hostage and forced, along with her mentor Dr. Chu, to operate at gunpoint on a criminal. Five-0 investigates the murder of a man whose body may hold the key to a 20-year-old case involving a kidnapped girl whose father never stopped looking for her. Five-0 must locate a teen girl who purchased a gun from a junkie, and discover that the firearm, over the course of decades, has affected all of their lives. Five-0 investigate the murder of a window washer and find that the victim is actually a renowned street artist who may have a politically motivated bounty on his head. Also, Grover and Adam look into the murder of a gambler, and Junior helps his father when they are reminded of his sister's death. Tani and Junior go undercover at a gym to track down a deadly batch of steroids that's killing users, before the drugs claim any more victims. Also, Danny and MacGarrett sub as bodyguards for Danny's high maintenance ex-mother-in-law, Amanda Savage, a wildly famous romance novelist with whom he has never gotten along. Junior is torn between his duties as a member of Five-0 and his feelings for his former girlfriend when her new love, the father of her son, is one of the culprits in a bank-heist-turned-homicide. When the top salesperson for a beauty company/pyramid scheme is murdered, Five-0 sifts through a long list of possible suspects who would want her dead. Also, Adam befriends a homeless man estranged from his family. While investigating Flippa's friend's murder, McGarrett and Grover uncover a deadly plan by an extremist group on the Island. Also, Grover has an emotional reaction to the case. Adam, Junior and Tani travel to the bottom of the Pacific Ocean when a murder takes place in a remote underwater lab, and the killer may still be on board. Still reeling from the murder of one of their ohana, Steve and Catherine, along with Danny, Junior and some old friends, Harry Langford and Wade Gutches, hunt down the killer. Also, Tani and Grover investigate when a bag of human bones, discovered inside an abandoned storage locker goes missing. After fighting off an assassin in his own home, McGarrett and Joe White flee to Montana to prepare for a battle against those exacting revenge for a past SEAL mission. Thanksgiving brings Grover's parents (guest stars Louis Gossett Jr. and Gladys Knight) and brother Percy, Jr. (Clifton Powel) to Oahu for a visit tainted by sibling rivalry, and Five-0 investigates a thief who is crushed to death by an empty safe. McGarrett investigates a cold case from the 1940s, one that his grandfather and the famous Honolulu detective Chang Apana worked on, and he tries to deduce how the case could have been solved. Also, McGarrett and Danny get ready for the opening of their restaurant. McGarrett crosses the line and is arrested while investigating the death of his former SEAL buddy, who died while making an emergency landing on an aircraft carrier, and the only survivor is a baby. Also, Adam returns to Oahu with some devastating news about his marriage. On Halloween, Jerry and his friends search his childhood camp for evidence to a murder he witnessed as a boy, while McGarrett investigates a little girl who drew pictures depicting the scene of a recent murder before it was discovered. Jerry accompanies Junior as he escorts a fallen soldier home to Oahu. Also, McGarrett and Danny discover a dead body when they delve into the illegal and highly profitable black market for sand. Crime spikes when a heat wave hits Oahu, causing McGarrett and Danny to hunt down a bank thief, and Tani and Junior's car is stolen while they're on duty. Also, Grover plays the golf game of a lifetime, and Kamekona incites a riot by price-gouging on his shave ice. McGarrett and Five-0 discover a Russian spy ring hiding in plain site on Oahu when a Russian nuclear attack submarine appears on the coast of Waikiki. Also, Tani is conflicted by her unnerving discovery at Adam's house. McGarrett joins Junior and his SEAL Team on a high risk covert mission to capture an elusive target who is holding his mentor, Joe White, hostage. Also, Gerard Hirsch and Kamekona help Grover and Tani on a murder case involving masterpieces stolen by the Nazis during WWII and Tani makes a shocking discovery. McGarrett and Five-0 take on the mob when a former boss is killed and Junior's friend Cammy Lin is on the run after witnessing the hit. Five-0 must help Duke after he is forced to steal crucial evidence from the police locker in exchange for his kidnapped granddaughter. Also, Jerry goes undercover at a mental health facility in order to solve a murder. Harry Langford enlists McGarrett and Danny's help to track down Lady Sophie, a teenage British royal who has run away while under his protection. Also, Grover, Tani and Junior work a 25-year-old murder case after a mysterious Betamax tape arrives at 5-0 headquarters. Catherine Rollins recruits McGarrett and Jerry to help her track down a uranium deposit thought to be hidden on an abandoned Hawaiian island before a suspected terrorist can make dirty bombs with it. Also, when Junior falls and is trapped in a ravine, he reflects on his estranged relationship with his father. A hitman, Leroy Davis, McGarrett's father failed to arrest comes to McGarrett to finally confess his crimes and admit where he buried his victims. Also, Jessie makes a dangerous decision that could ruin Adam's life. The ex-wife of the man who shot Danny comes to Oahu and reveals how Danny's protection during a dangerous domestic dispute when he was in New Jersey helped save her life. Also, Tani and Junior are assigned to walk the beat as uniformed officers for the day, and Adam is framed for the murder of the crime boss he has been tracking. Adam's mission to take down organized crime on the Island goes sideways when deadly chlorine gas he was using to bait a big fish falls into the wrong hands. Also, Adam begins to doubt Jessie's allegiance. Tani and Junior go undercover as prospective parents in order to infiltrate a private school where the headmaster was murdered. Also, Adam's life is on the line when he is held captive and forced to produce a hidden massive amount of money. McGarrett and Danny investigate the murder of a private detective whose client was killed the same way, and Adam sends Jessie into a dangerous situation with disastrous consequences. Also, Danny's uncle, Vito, comes to town to help Danny and McGarrett get their restaurant up and running. When a man accused of killing his wife threatens to commit suicide, Grover reveals how he too was once on the brink of taking his own life. When an FBI agent who was cracking down on organized crime is killed, McGarrett rounds up every gang-related criminal on the island to find the culprit. Also, McGarrett tasks Adam with forming a new division within Five-0 to take on organized crime. It's Christmas Eve and Danny tells Charlie a bedtime story about a recent Five-0 case involving criminals dressed as Santas and a holiday miracle. At Halloween, Five-0 must investigate a string of murders that mirror stories from well-known Hawaiian folklore. Also, Grover is called to visit a man hours away from execution who may hold the key to a case that has plagued Grover for years. 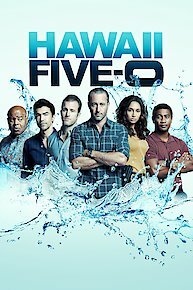 The lives of Five-0's informants are in danger when the HPD system is hacked and one ends up dead, forcing McGarrett to enlist the help of hacker Aaron Wright, who he just imprisoned. Five-0 enlists the help of an old friend when the boss of a major crime family is murdered, triggering revenge killings across the island. Also, MacGarrett and Danny begin sorting out particulars in their new restaurant venture. McGarrett and Five-0 work with an injured police dog who is the only witness to an ambushed drug bust. Also, McGarrett is visited by Junior Reigns, a former SEAL, who is looking to join the task force. Beulah Koale joins the cast as Junior Reigns. McGarrett and Danny recruit Tani Rey to join the task force when diabolical hacker Aaron Wright releases a dangerous arsonist from prison. Hawaii Five-0 is currently available to watch free on CBS and stream on CBS. You can also stream, download, buy, rent Hawaii Five-0 on demand at Amazon Prime, Amazon, Vudu, FuboTV, FandangoNow, Google Play, DIRECTV NOW, iTunes online.